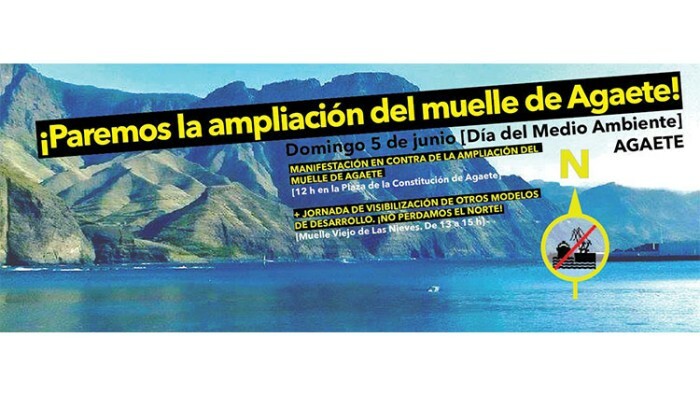 We thank you very much for your contribution to be able to pay the legal claim against the irregularities of the Macromuelle de Agaete project! You will receive an acknowledgment email. 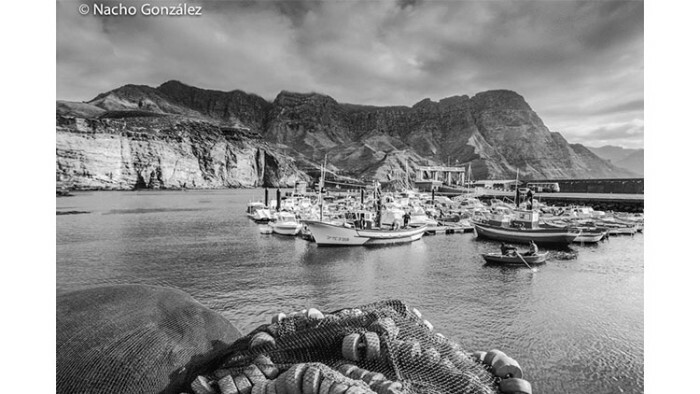 We thank you very much for your contribution to be able to pay the legal claim against the irregularities of the Macromuelle de Agaete project! 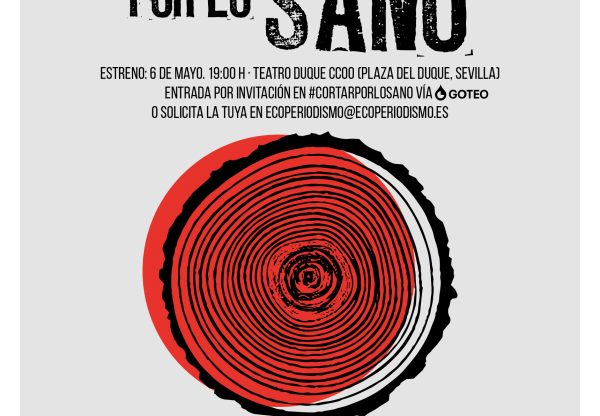 In addition to the recognition email you will appear on the public thank-you poster on social networks (poster in jpeg). 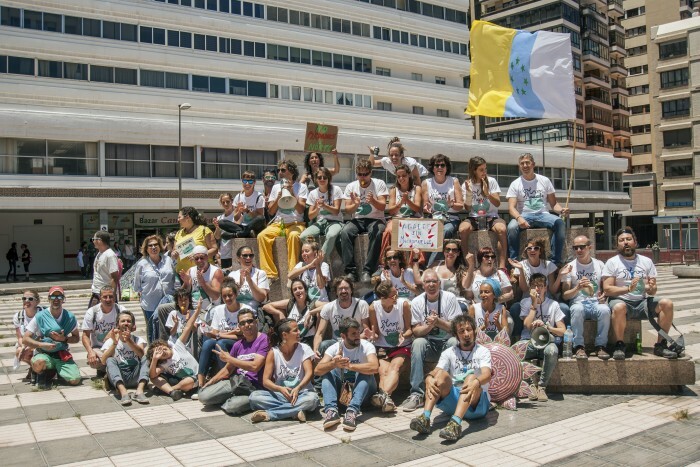 In addition to all the acknowledgments of the world both publicly and privately with your digital saviour diploma, you will receive a cotton bag from Save Agaete with an exclusive design of the artist Lia Ateca. If in an assembly of your association, collective, business, company or group of friends you have joined together to make a joint donation and support the legal cause, we will include you with the rest of the allies of the legal process. Thank you! Guided tour in a agaete farm including tasting of products. 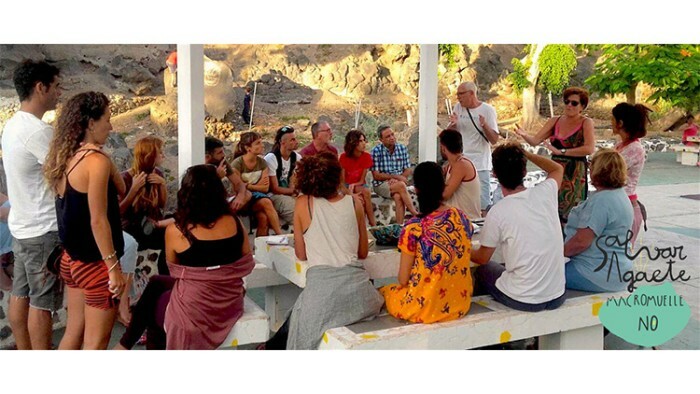 Wine tasting, with cheese and toasted bread; and coffee with cake; including a guided tour of the finca, you will receive a cotton bag from Save Agaete with an exclusive design of the artist Lia Ateca. 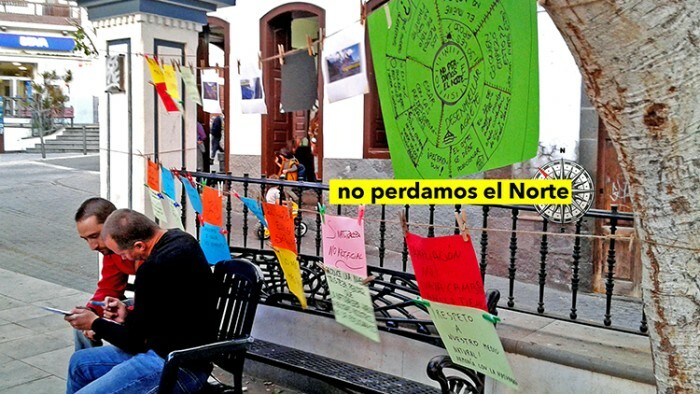 We want to appeal judicially the award of the work of the expansion project of the Puerto de las Nieves because of administrative irregularities in it. 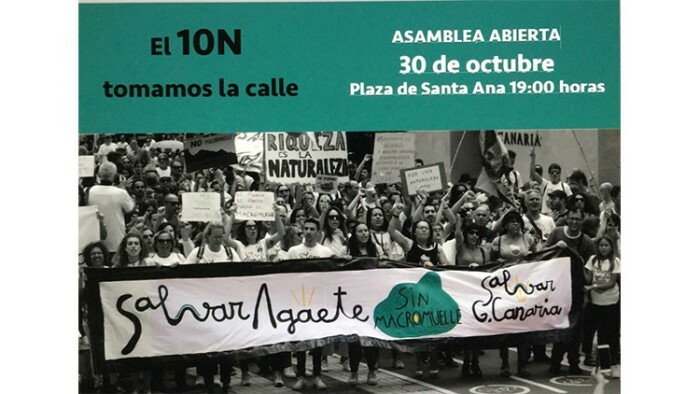 We already have some savings from donations and T-shirts sales to add up to 8000 euros which we’ll use to file lawsuits by administrative means. Previous experiences in similar processes taught us that challenging damaging public works can take long periods of time and expenses can increase more than expected. To prevent this situation, it would be useful for this platform to have a contingency fund to face delays and costs. To prevent further expenses (technical advice, assessments...) in case of an uncertain legal process it would be coherent to expand crowdfunding expectations. 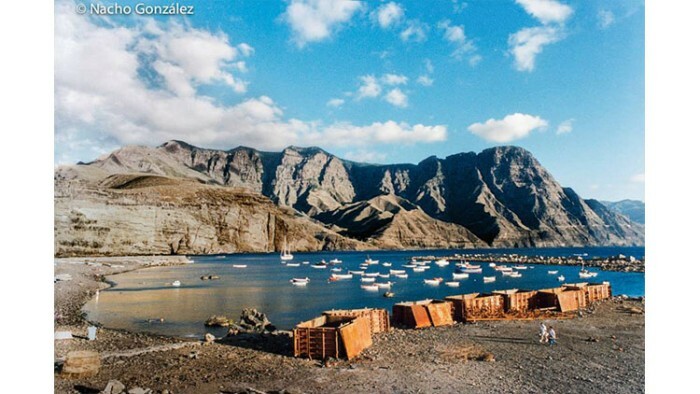 Some leaders of the Canary Islands Government and the public entity Canary Ports intend to build a macromuelle in Agaete, one of the most emblematic cultural towns of the northwest of Gran Canaria, located within the borders of the Tamadaba Natural Park, one of the places with the greatest scenic value of the island. The project has no basis or strength or positive aspect that justifies its construction. Next, we will show you some whys. 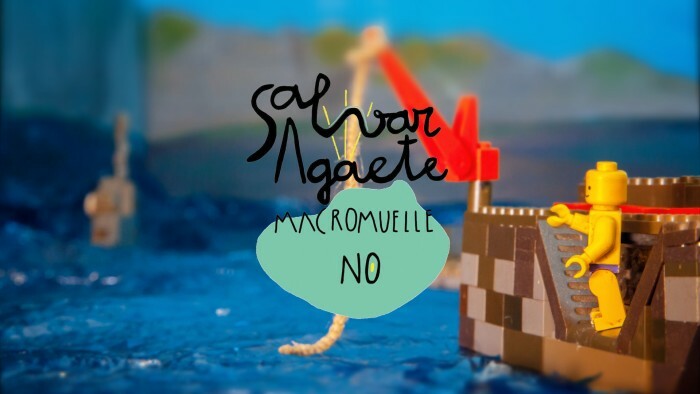 Therefore, from the Platform Save Agaete without Macromuelle, we launched this crowdfunding campaign with the aim of collecting the necessary funds to fight legally against this project, which has a wide range and innumerable irregularities, clearly an object for legal complaints. (1) They hide between the assumption that the extension will guarantee free competition ... but do not think about the option of a shared dock. The judgment of the Court of Justice of the European Union on March 15, 2018 dictated that "The Ports Authority was obliged to take the necessary measures to guarantee that access to said port was open under non-discriminatory conditions to all potential users that operate fast ferries ". 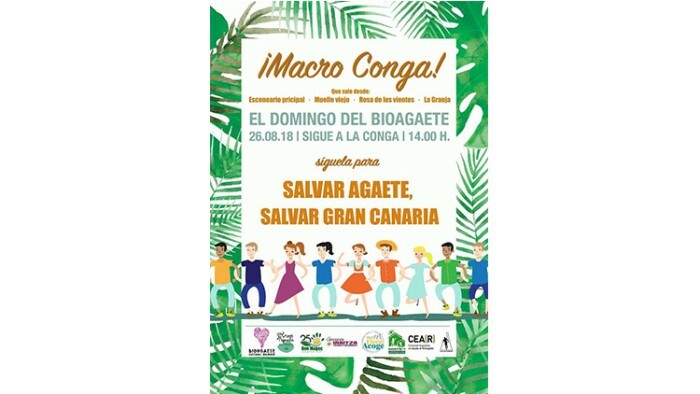 Under the slogan of fostering competitiveness, the Government of the Canary Islands wants to foist another macro-infrastructure on us, without evaluating the option of dividing the berths between the different companies. 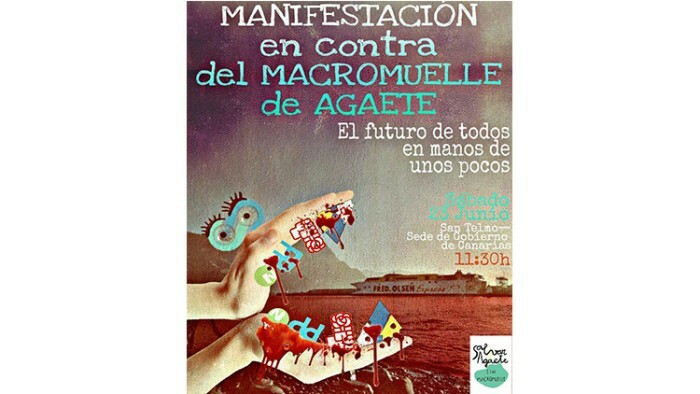 Thus, Fred Olsen, would be clearly favoured while the works are carried out (maintaining the monopoly in Agaete) and, once finalized, would continue with their business with the same current frequency, as the journalist Silvia Álamo explains in her article "[ The sentence that explains the careers of the Government of the Canary Islands with macromuelle de Agaete] (https://www.eldiario.es/canariasahora/politica/sentencia-Gobierno-Canarias-macromuelle-Agaete-monopolio-Fred-Olsen-Armas_0_824168114.html ) ". (2)They ensure an economic improvement for the whole northern region thanks to the macromuelle ... but there is no one to justify it. 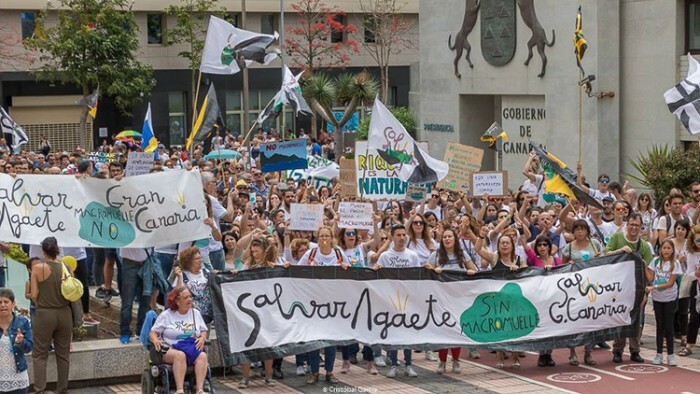 However, the economic justification of the project was made 15 years ago and the Environmental Impact Statement ( which is not favorable, but conditioned ), requires precisely in one of its requirements to update this justification before the start of the works. To date, there is no study that justifies the work. 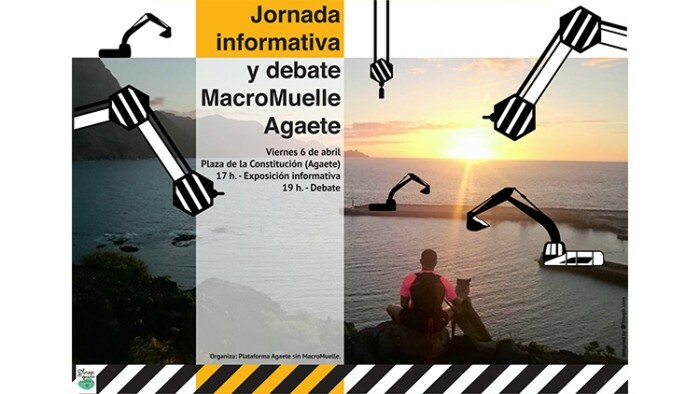 On the contrary, Gran Canaria economist José Antonio García has developed a [deep analysis] (https://www.infonortedigital.com/portada/images/noticias/PDF02/PDF_2018/estudio.pdf) on the economy of the municipality of Agaete and the Commonwealth of the North of Gran Canaria. (3) Really nobody swallows this, but even so, they insist that it will not affect the environment. Wrapped in certain irony, they even assure us that "this is not a new dock", but that it is "a transfer of the current dike further into the sea ..." - A tremendous invention! Even if that was true, half a kilometer of concrete (530 m dike ...) supposes an atrocious visual impact on any horizon, and even more so on the one of the town of Agaete. To build it will, in addition, submit again those who enjoy bathing and sunsets in this village, to the acoustic and atmospheric pollution of the more than 300 daily trips of trucks of more than 20 tons that are estimated to be used in the project itself. 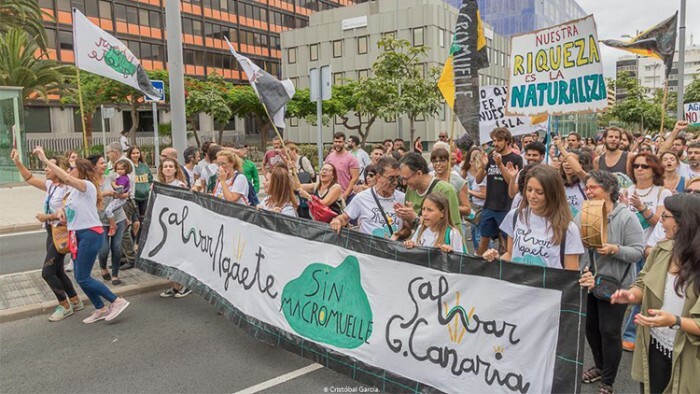 All this without mentioning the implications for marine fauna and flora, for which no type of environmental measure is contemplated by the Canarian government (conditions that must be corrected as part of the Environmental Impact Statement). And what do they tell us about recreational use and fishing during the at least five years that the work is estimated to last? The turbidity plume would easily reach the populations of Cystoseira further south. 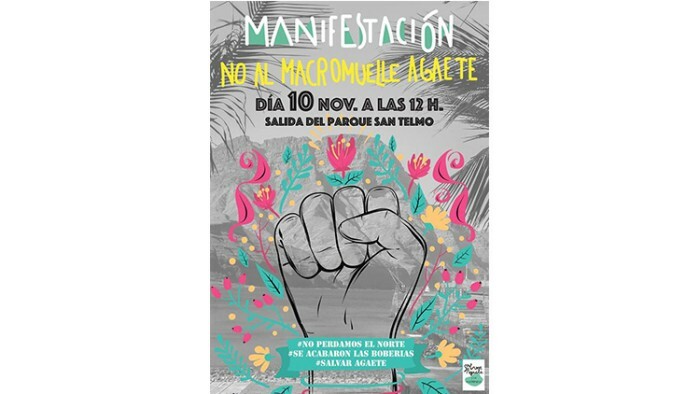 And not only would the work affect the surroundings of the dock, it turns out that the new access could seriously affect the natural pools of Las Salinas. Or the beach of Guayedra, one of the few remaining in its category. 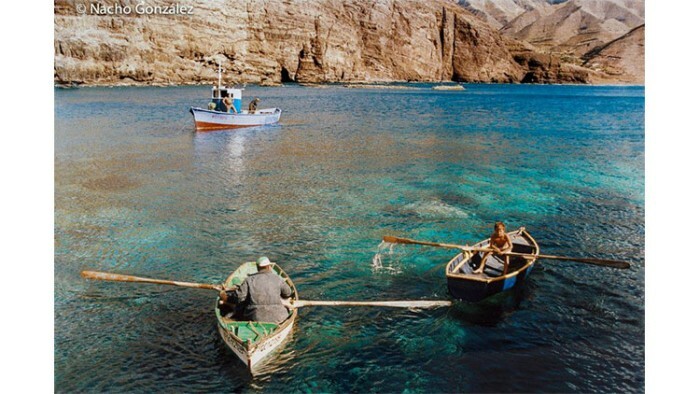 We must also take into account the Tamadaba Natural Park, which is within 300 meters from the place of action. It is an area declared as an Area of ​​Ecological Sensitivity and as a Special Protection Area for Birds (SPA), where there are significant specimens of both plant and animal species that give the environment an exceptional richness. They say that more capacity is needed, that the number of passengers has increased ... but the occupation percentage barely exceeds 20% in the last seven years! 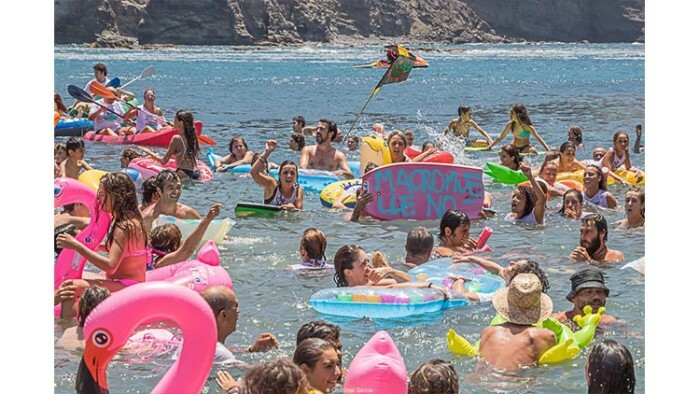 The Canarian government justifies this section using data of the year 2003, when there was an increase of passengers with respect to the previous year, which is true. However, if we expand the range, with data obtained from Canarian Ports, we see how the occupation percentage has barely exceeded 21% in the last 7 years. And that the discount of residents has not stopped rising! 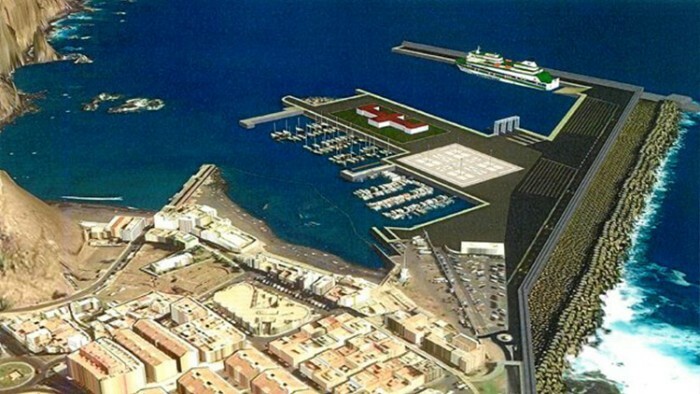 Also, add to this the incongruity of having invested 70 million euros in the Puerto de la Luz, in Las Palmas, to improve trans-insular transport, from where a new fast ferry departs. Counting the half-hour journey by car between Las Palmas and Agaete, arriving in Tenerife takes as long from Las Palmas as it does from Agaete. 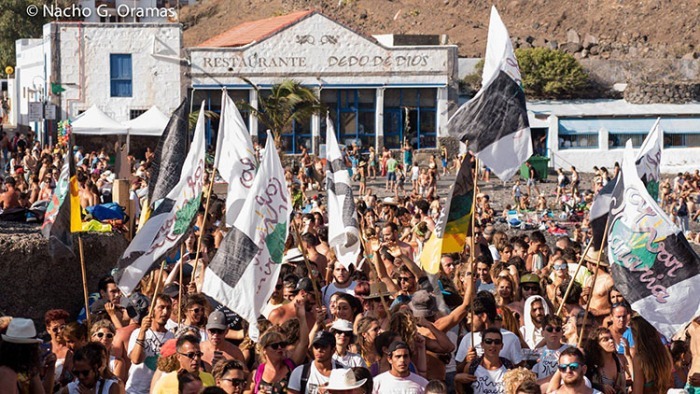 Day by day we continue to multiply the supports and the struggle to #SaveAgaete gets bigger while it does not stop winning allies: individually and in associations, businesses in the town and even the City Council at this time has expressed to be against the project. 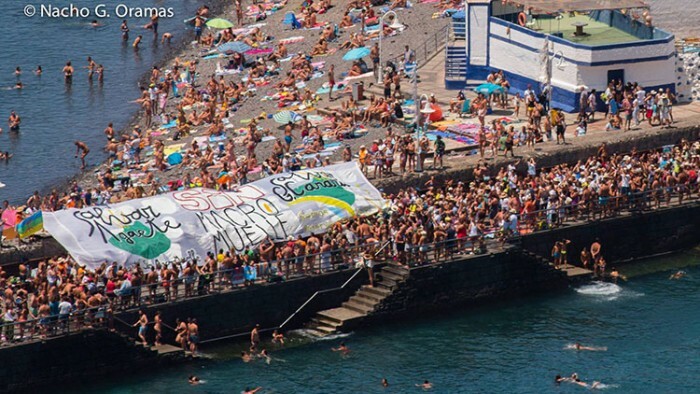 The Government of the Canary Islands and Canary Islands Ports continue, committed to foist upon us a socially rejected infrastructure ([we have been denied a referendum] (https://www.laprovincia.es/gran-canaria/ 2018/08/30 / ayuntamiento-agaete-rechaza-muelle-negativa / 1092596.html), but the interviews of the City Council of Agaete returned [an 80% rejection of the work] (http://cadenaser.com/emisora/ 2018/06/22 / ser_las_palmas / 1529688002_337844.html)). Arrived at this point, we have thought that, without leaving the other actions of the platform behind, that we have to undertake the legal route counting on professionals. 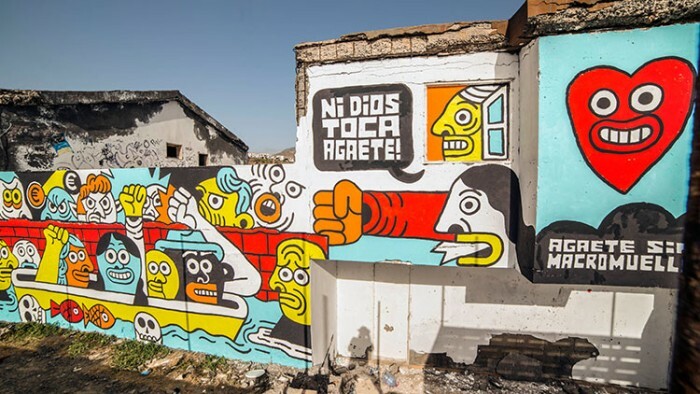 We play from an advantaged position, because the expansion project has a long journey and numerous atrocities along the way, both administrative and environmental. We only need the money to present different claims that manage to overthrow what democracy and coherence are not able to rectify from politics. 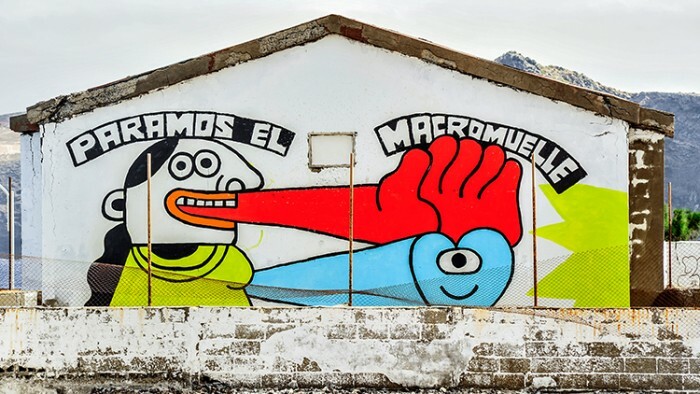 Quoting our colleague Pepe in this [article of ElDiario.es] (https://www.eldiario.es/canariasahora/canariasopina/macromuelle-Agaete-autoritarismo-destruccion-ambiental_6_820727922.html), "at this point it is almost unquestionable that the determination of the Government of the Canary Islands to approve and tender the project to expand the port of Agaete is a totally authoritarian political act that responds only to the demands of large private companies camouflaged, perversely, under the umbrella of the general interest. " 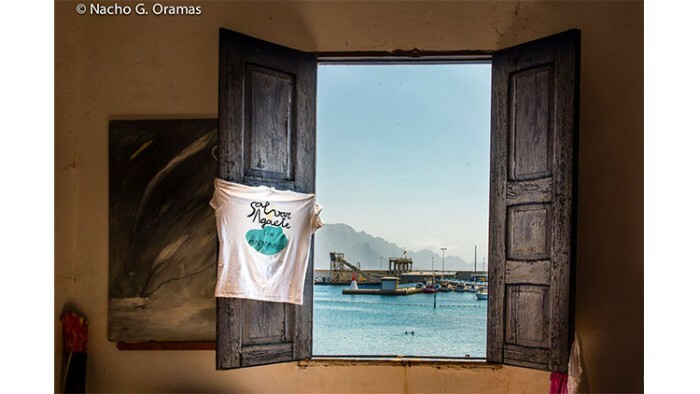 Thus, from the Platform Agaete Without Macromuelle we bet on a system that respects the opinion of people, biodiversity and the future of our land, where opaque forms of government, closed to dialogue and alien to the environmental dynamics in which we would like to develop ourselves. 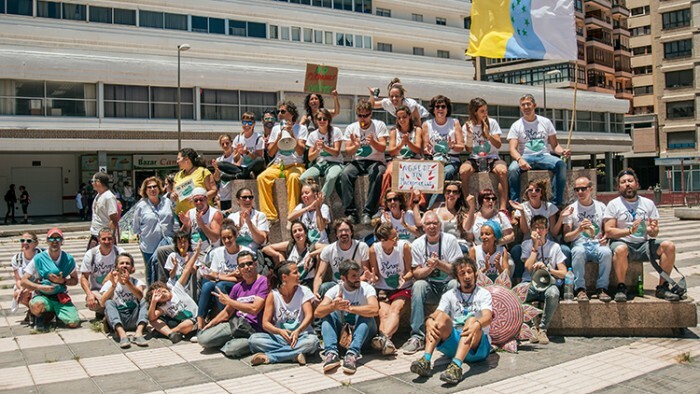 We believe that another way is possible, in the way of understanding, and we believe that we have the duty to safeguard the beauty of this place and to guarantee future generations the sustainability of their resources. 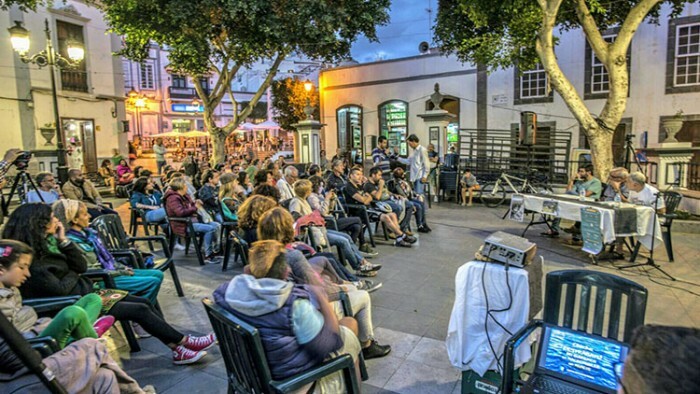 The first citizen assembly of the Platform took place on May 1, 2016, where the members could have a first contact with the residents of the town of Agaete and also other municipalities on the island. The purpose of this first assembly was to give information about the project that was already underway, specifying the social, economic and environmental impact on the environment. 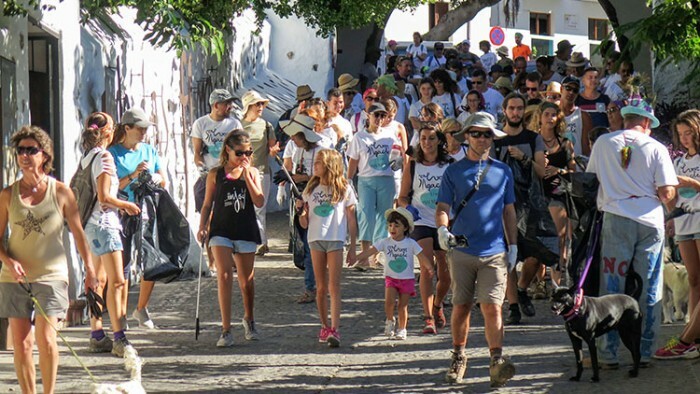 In addition, it was possible to learn about the different opinions and proposals of the attendees, creating an environment conducive to further progress in a united way about this issue that affects not only the municipality of Agaete, but of the Canary Islands as well. 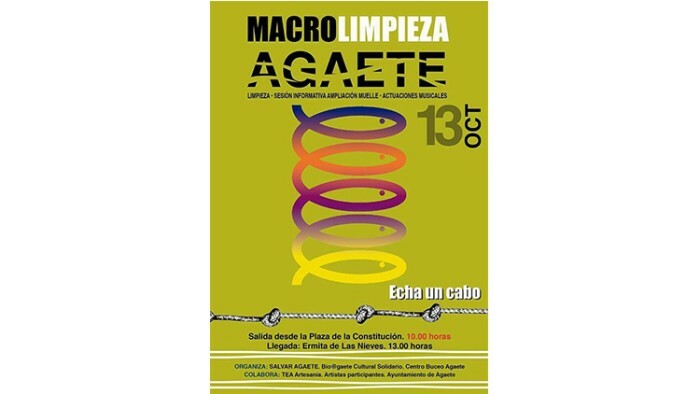 After this assembly, another was held in Las Palmas de Gran Canaria so that people who were not from Agaete had access to the Macromuelle project. 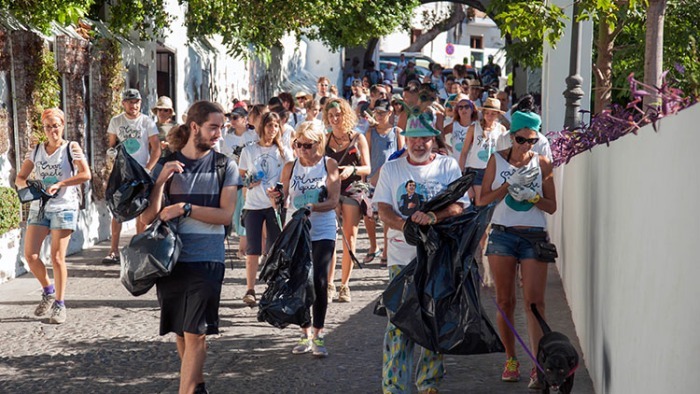 It was on June 5, 2016 (Environment Day) when the first manifestation of the platform took place, which began with a rally in the town square and neighbours marched to Puerto de las Nieves where a manifesto was read. 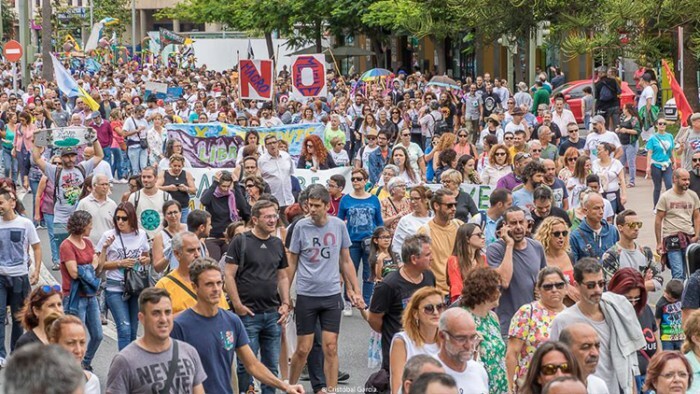 Parallel to the assemblies and the demonstration a petition for signatures was held to stop the project. 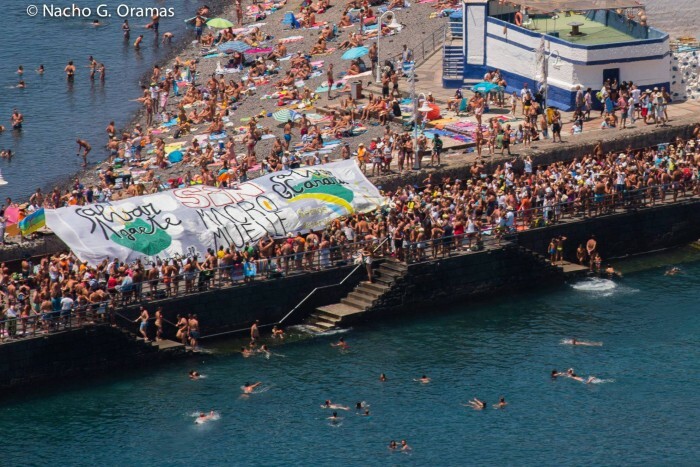 It was obvious that an important part of the citizens were against the construction of the macromuelle. 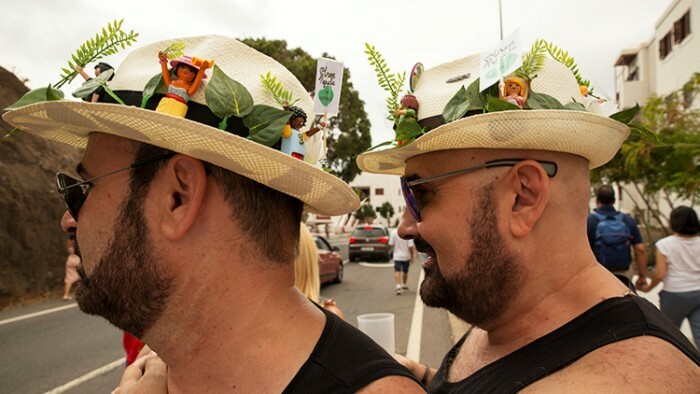 For more than a year neither the town hall nor the political parties spoke about the project, since their argument was based on the fact that it depended on the Canary Islands Government. 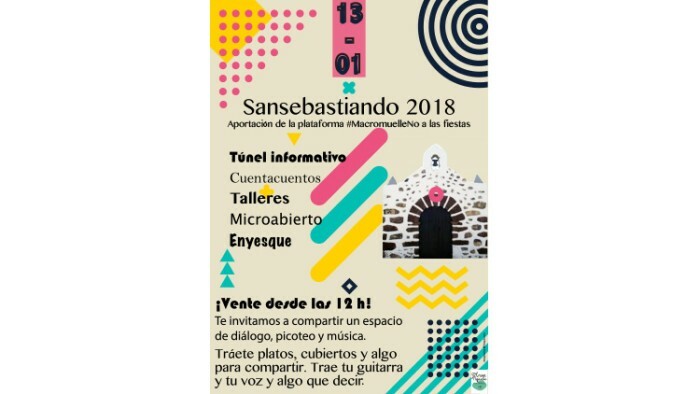 However, at the beginning of this year 2018 an extraordinary plenary session was held at the Town Hall of Agaete where a debate was held about a referendum. There was a great presence of neighbours and the media. The consultation was approved by most of the town councilors and moved to the central government, but the response was negative. But, it is at the moment when the adjudication of the work in the press comes out when there is an "awakening" by both the citizens and different political parties. 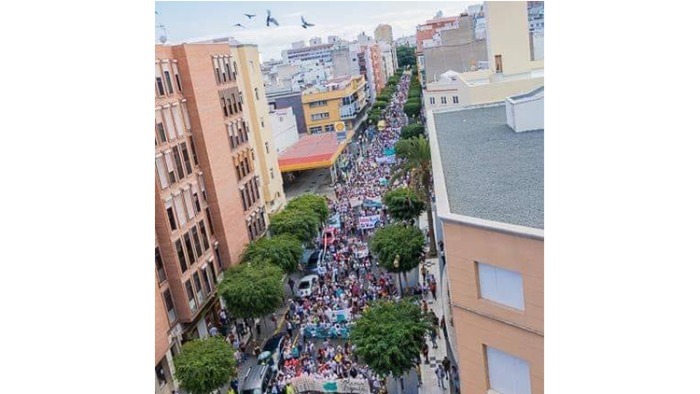 We began to appear almost daily in the press and the Agaete Without Macromuelle Movement began to organize a large demonstration to be held in the capital of Gran Canaria with a rally in front of the headquarters of the Canary Islands Government. 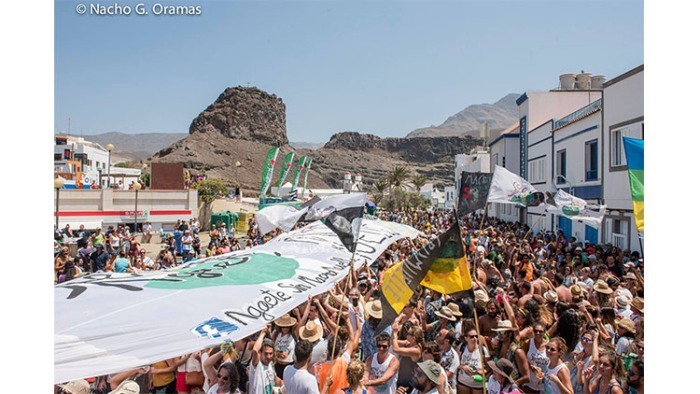 Twelve thousand people came to say NO to the macromuelle of Agaete. This caused that the platform took a great impulse and that more and more people were united in the fight. 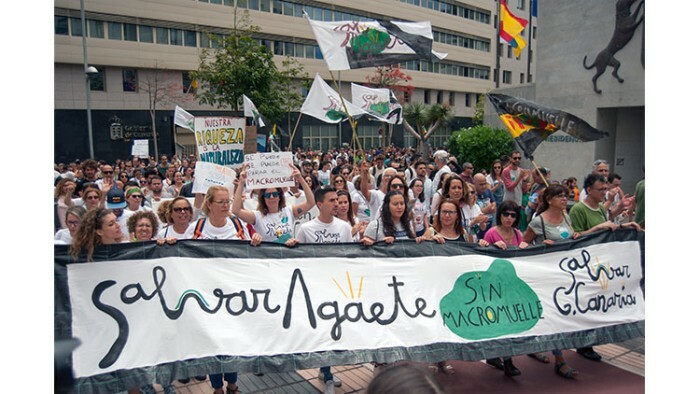 As a result of this, there is a positioning of certain parties against the extension of the dock, and they brought the debate to the Gran Canaria Island Government and the Parliament. For our part, as a platform we continue to organize meetings, assemblies and receive economic support by selling T-shirts and stickers at different events. We consider, therefore, that the struggle is won in the street, but we do not stay there. We believe that we must resort to legal channels as there are different irregularities in the approval of the project. Our current goal will be to raise enough funds to win the fight in the courts. 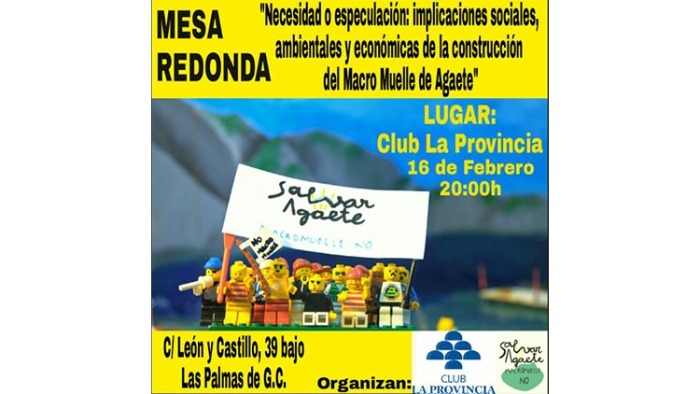 From the Platform Save Agaete Without Macromuelle we are mobilized by the social, environmental and economic commitment to safeguard the value of this environment in the face of the threat of a new project that, in addition to supposing a waste of public money, raises an infrastructure that affects our fragile and limited territory, without assuming any benefit for the community.